Each year the Women's Institute selects a 'resolution' that is voted upon by members to support or not; they then use their organisation's voice and resources to campaign, usually to tell 'government' what to do. This is a cultural thing that goes against my grain; I'm more likely to resolve what I'm going to do, not tell someone else what they should do. But that's just me. There have been a few resolutions in recent years that seemed to me a bit pointless. However, this year's resolution was pretty darn good. It's about increasing awareness of organ donation. "The NFWI notes that three people die every day whilst waiting for an organ transplant. We call on every member of the WI to make their wishes regarding organ donation known, and to encourage their families and friends, and members of their local communities to do likewise." You can't really argue with this one can you? It doesn't say DO IT, it says everyone should think about it and make their wishes known. Vivien and I went along to the presentation at the regional office a few months ago to learn more. The two nurses who did the presentation began by saying it was 'an emotional subject' but I was thinking 'Yeah, right. It's pretty straight-forward really.' However, I was leaking profusely by the end of the talk, trying to surreptitiously dry my face. Vivien was either pretending not to notice or pretending she wasn't with me, I'm not sure which. Anyhow, this is what I learned. Organ donation can a very cost effective procedure. I think they said that the average cost of keeping a recipient alive while awaiting their transplant is about £35K per year. They will still require a lot of medical attention afterwards and have to take immuno-suppressing drugs, but the aftercare is only something like £5-7K per year. In any given year in the UK there are over 7,000 people waiting for a transplant of some kind but only about 3,000 transplants take place each year from about 1,000 donors. Obviously a person can donate multiple organs to multiple recipients, but it is still astonishing that there are only 1,000 donors each year when there are over 20 million people on the donor registration system. This is for a number of reasons. One is that the donor can't have died from any cause that could be transmitted by transplant to the recipient. Another reason is that the donor needs to be under medical care at the time of their death, ie in a facility, such that the viability of their organs can be maintained. That lets out anyone who dies at home in their bed, etc. And of course donors have to be matched with the recipient for a good outcome, but this matching happens not just in the country but throughout Europe and for all I know perhaps farther. One of the main problems here is that even though a person might have put their name on the donor registry, at the point of death the family will be asked their permission. Bizarrely, almost any member of the family can decline to have the donation take place and it won't happen. There is no hierarchy about who can and cannot overrule the deceased's decision. In theory, a step-daughter or a son-in-law might scare the doctors off if they are adamant that it will leave them with emotional scars, even if the spouse or children are happy for it to commence. NHS doctors are frightened of hysterical headlines in the tabloids: They stole my step-mother's kidneys! Though the media have a lot to answer for on may fronts, I couldn't help but think it would be a fairly dysfunctional family who couldn't come to some agreement in lines with the wishes of the departed, but then the whole arrangement strikes me as dysfunctional. I read a report somewhere - I think it was US data - that indicated that organ donation correlated with level of education, which makes sense. To be fair, there may be situations were the deceased is not on the organ donation registry and the family are unsure of what they would have wanted. Though my parents and I never discussed the matter specifically, I'm pretty certain I know what they would have said, just the same as Bill: My bits won't be of any further use to me, if they can do good elsewhere then of course they should be donated - don't be silly. 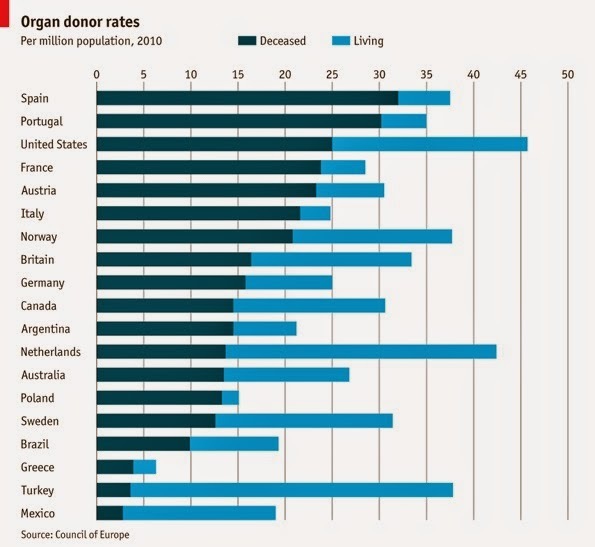 Britain is well behind Europe in meeting the needs of their transplant patients. Spain, we were told, is in the forefront on this, probably because their laws require a post-mortem exam on every death, not just selected ones. So people are probably more accustomed to the idea of the surgical processes that will follow the death of their loved ones. Wales has decided on a different system which will take effect in December next year. After that anyone who has been resident in Wales for at least 12 months and over the age of 18 will be 'deemed' to be willing to be an organ donor rather than not willing. People can still opt out and family members can still object, but it will be with the understanding that the deceased didn't opt out and so by default can be 'deemed' to have desired their organs to be donated. Knowing that I was to report back to our WI group - I had 5 whole minutes - I did a bit more research, for them and for me. Religious beliefs aside, there were only two points I found made against donation. One is that the family might be confused at their loved one being kept on life support until the organs could be removed. The difference between 'alive' and 'on life support' would need to be explained, possibly well in advance. Another idea, which may bother some people, is that the neither the donor or the family gets a say about who receives the transplant. The 'gift' of organ donation can have absolutely no strings attached other than the medical considerations for potential success. I think this is part of the beauty of this sort of giving. 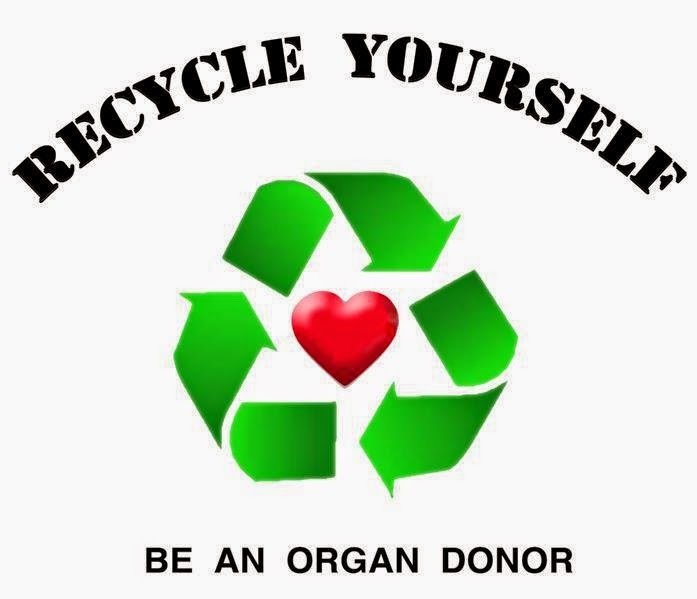 Even if it's the polar opposite who might receive my organs, it's still better than a trash can I think. My only personal squeamishness about this is the thought that perhaps at some point in my old age the NHS might decide I'm worth more as body parts than as a functioning human being. I recognise this as emotional scars from my old job and I try to ignore it. In any case, under current policy anyone over 85 years of age isn't considered eligible to donate their bits anyhow and I certainly plan to live beyond that. No one else I've talked to considers this, so I know it's just my own foolishness. Perhaps strangely, the part of the presentation that got to me was more the stories about the donors' families than about the recipients: a woman who lost two sons to cycling accidents and was relieved that she was able to donate at least the organs of the second son; a woman whose grief at losing her husband was interrupted briefly by joy at the idea that his organs could help someone else. Also about a man who lost his daughter but managed to connect with the teenage boy who received her heart. The boy was a runner; transplant recipients are fanatic about their health, they need to be. The father showed up to cheer this boy at his races, taking some comfort from the good that came from his daughter's death. I wrote years ago about my Aunt Rita's organ donation. She was a nurse and had started saving lives even before she left nursing school when she was first at the scene of a car accident. We were all proud of her for many reasons and on many occasions and her organ donor decision was just another example of the incredible person she was. I know she would be pleased herself to know that she had - once again - been able to prolong someone else's life. Bill and I have had this conversation between ourselves and with each of his children. I thought I'd suggest - where ever you live - that you consider your own wishes - whichever your views - and have that conversation with your loved ones as well. I mistakenly published this a month early and a comment brought this to my attention. I've re-scheduled it for the correct date. In the meantime, I've learned a very sad story about a lady in our WI craft group. Last I saw her she was very pregnant with twins and we heard she'd had two girls in addition to their 2 1/2 year old son. Organ donation was important to her because of their son's cystic fibrosis; people with this condition may need a lung transplant later in life. When the twins were only 12 weeks old their 43-year-old father, a keen, fit cyclist, was knocked off his cycle and suffered a fatal brain injury. Having discussed their views about organ donation she asked for this to happen and says it gave her something to focus on and brought some comfort to her and his other family members. 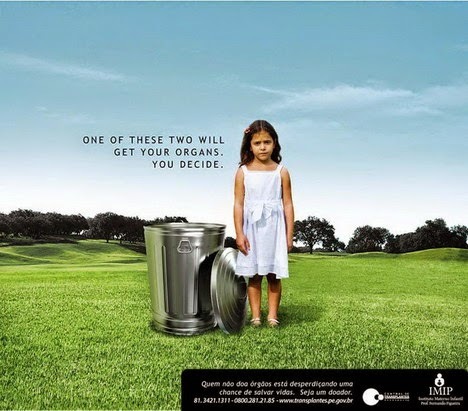 There was an interesting study about opting in versus opting out of a choice regarding organ donation. I believe the whole idea is we all tend to go with the default option. Maybe I read it about it in one of Malcolm Gladwell's books? Recently I heard the story of a woman who had a loved one in hospital and she discussed how challenging the decision was to make. In her circumstances, her family member was in a coma. It was explained to her if she decided to donate organs, the person would be taken into the operating room and surgeons would remove the organs and the person would die during the procedure. Though the family member was in a coma without possibility of recovery, the family wanted to be with him at the time of his death. I could see how it would be a really difficult decision to make at a very emotional time. This is a worthy topic, but I find most people can barely manage to discuss death or funeral planning, never mind organ donation. We don't like to think about death in modern society. Extremely worth topic Shelley and so well presented. I am an organ donor. I would wish that any of my family needing an organ to survive would be so helped, so I decided I needed to be a helper...provided I too don't live to my planned age of 100!